If you're an income investor, forget dividend stocks and check out these three high-yield ETFs today. If you're wary of the risks associated with owning individual stocks, exchange-traded funds (ETFs) can be an excellent substitute, especially for income investors. High-yield ETFs provide exposure to a diverse basket of dividend stocks, allowing you to earn fat dividend checks without having to spend time researching individual stocks. However, not all high-yield ETFs are safe or give you value for your money. So to help you make sound investing decisions, our contributors have picked three high-yield ETFs that they believe could power up your portfolio: Global X SuperDividend ETF (NYSEMKT:SDIV), iShares U.S. Preferred Stock ETF (NASDAQ:PFF), and PowerShares S&P 500 High Dividend Low Volatility Portfolio (NYSEMKT:SPHD). All three ETFs are unique, so read on to learn which one suits you best. Rich Smith (Global X SuperDividend ETF): Last month, I made the case for seeking out ETFs focused on international dividends, arguing that if the U.S. dollar is strong now, then it must eventually weaken, making foreign dividend-paying stocks a smarter investment play for the long term. I still think that way today. Nobody's perfect, and I think it's a fine strategy to hedge one's bets against the possibility that one is wrong. In that vein, today I'm going to suggest you take a look at a more balanced ETF -- one primarily weighted toward U.S. stocks but with a healthy leavening of international dividend exposure as well: the Global X SuperDividend ETF. ETF.com describes the fund as a "high-yielding basket" that "favors small firms," mostly in the financials and energy sectors. But while Global X SuperDividend leans toward small companies, it's not a small fund. In fact, the Global X SuperDividend ETF boasts nearly $850 million in assets under management. It pays a whopping 6.6% dividend yield, which, after deducting an expense ratio of 0.58%, leaves you with roughly 6% in dividend profits annually -- an even bigger profit than was offered by my SPDR S&P International Dividend ETF pick last month. Thus the "net dividend" you receive from owning SDIV is worth nearly three times the current 2.14% yield on the S&P 500. Valuationwise, this ETF's stocks carry an average P/E ratio of 13 -- which is also well below the S&P's average P/E of 20. It may not give you all the international exposure of the SPDR S&P International Dividend ETF. But I think that with a better return and more diversification, the Global X SuperDividend ETF is a fine bet to pay off. Reuben Gregg Brewer (iShares U.S. Preferred Stock ETF): When you build a portfolio, you're balancing one investment against the others you own. Your holdings interact, and if you aren't careful, you might end up with more risk than you think. This is why the iShares U.S. Preferred Stock ETF should be on your radar screen. I'm not going to lie -- it's kind of boring. But that's the point. The iShares U.S. Preferred Stock ETF owns exactly what its name implies. A preferred stock is an odd animal that sits above equity in the capital structure, but below debt. Generally speaking, preferreds are sold with a par value and a set dividend that has priority over common stock dividends. These securities tend to trade pretty close to par value (often $25) most of the time. iShares U.S. Preferred Stock ETF has a heavy weighting in financials, an area that sees more preferreds issued than other sectors. Its trailing annualized returns over the three- and five-year periods through February, meanwhile, are both basically 6%. Its trailing yield is around 5.7%. Do the quick math and you'll see that most of your return is going to come from dividends. Which is pretty much what you'd expect of this asset class. But here's the fun part, iShares U.S. Preferred Stock ETF's standard deviation, a measure of volatility, over both those periods was a little over 4. Comparatively, the SPDR S&P 500 ETF Trust (NYSEMKT:SPY) had a standard deviation of 10 in those periods. So the iShares U.S. Preferred Stock ETF provides a relatively large yield, price stability, and the opportunity to take on more risk elsewhere in your portfolio. It's a great option for the diversification balancing act. Neha Chamaria (PowerShares S&P 500 High Dividend Low Volatility Portfolio): When I'm looking for high-yield stocks or ETFs, I prefer ones that offer an extra layer of security to those with sky-high yields that may carry substantial risk. 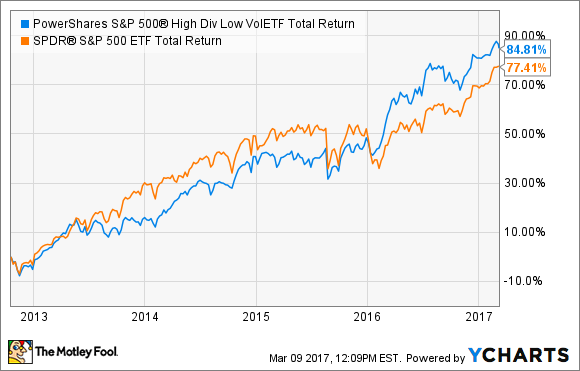 Invesco's PowerShares S&P 500 High Dividend Low Volatility Portfolio is one such ETF I'd urge you to consider today. As the name suggests, this ETF offers you nice dividends without the volatility that could give you sleepless nights. It does so by tracking the S&P 500 Low Volatility High Dividend Index, which comprises the 50 "least-volatile high-dividend yielding" stocks in the S&P 500 that are chosen based on the standard deviation of their daily prices over the trailing 252 trading days. So the highest-yielding stocks that were also the least volatile make it to the final 50. For an income investor, I think such an ETF is an excellent tool to earn secure income. In fact, if you compare PowerShares S&P 500 High Dividend Low Volatility Portfolio's performance since inception with that of an ETF that simply tracks the S&P 500, such as the SPDR S&P 500 ETF, you can see how focus on low volatility helps. As you may have guessed, the PowerShares S&P 500 High Dividend Low Volatility Portfolio has the greatest exposure to defensive sectors: Utilities constitute nearly 22% of the portfolio as of March 6, 2017. That aside, I also love the fact that this ETF has substantial exposure to REITs. While core real estate stocks can be volatile, REITs leverage investors to the growth potential in real estate while offering hefty dividends that aren't too risky because of the business structure. Not surprisingly, the Iron Mountain and Welltower Inc. REITs are currently the top two holdings of the ETF. Then again, no single stock makes up more than 3% of the ETF's funds, which is also one reason it isn't too volatile. Given its low volatility and current SEC-defined yield of 3.74%, I think the PowerShares S&P 500 High Dividend Low Volatility Portfolio is a great pick to power up your income portfolio.